Ivan Ukhov (He must be the most weird athletein 2012 Olympic - in his age of 26, this Russia High Jump athlete won the gold medal on August 8, 2012 London Olympic in the men’s high jump. He did so while jumping in a blue t-shirt. Yes, you didn't heard me wrong! Because he had lost his vest after he pulled it off, after getting approval from the referee, he went out in a standard t-shirt and beat everyone else. After then he found his vest and attempt 2.36 , 2.38 and failed on 2.40 after his first trial which possibly set the new world record being booked by Charles Austin (2.39) in 1996. Ivan Ukhov is happy with bringing the Olympic Gold Medal home! Ukhov was expected to be a basketball player, after 9 years of basketball player's life he joined Discus throws and finally turn into High Jump at his age of 17. 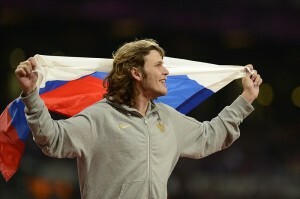 The long-hair Ukhov is now a Russian legend, particularly in light of his previous most memorable moment. Back in 2008, he showed up to a meet drunk and tried to do some high jumping. He failed and slept on the mat!